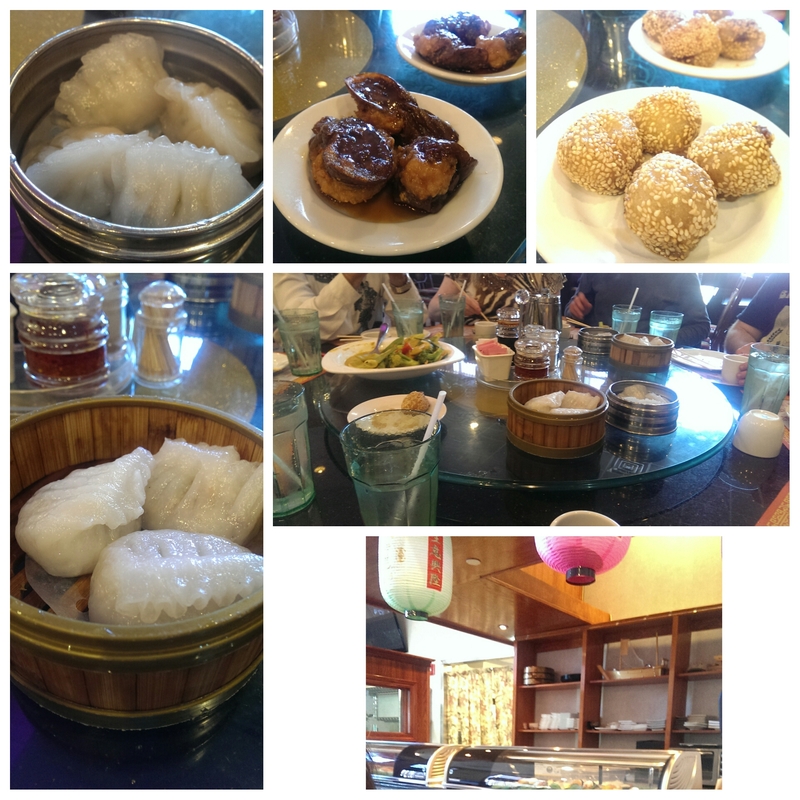 My friends and I did part two of last week’s dim sum crawl today. We met at 11:30 at E. 30th Street Cafe. It is at the back of Asia Plaza, off the parking lot with Park to Shop grocery store. We were the only table for a little bit, but a few other diners came after us. To be honest, I was nervous about the dim sum here, because no one ever talked about this restaurant or its dim sum. Last week there were only a few occupied tables, while Li Wah on the other side of the plaza was packed. I did some reconnaissance the night before and was pleased to see a very extensive dim sum menu of 50 items. I picked some ones that I knew no one else offered and was quite excited about the idea of a steamed chicken bun or cilantro shrimp dumpling; however, when we started ordering we were told that the restaurant had new owners and they had gotten rid of a lot of the dim sum. In fact, they were closing on the next day so they could renovate for 10 days and reopen as a new restaurant (Szechuan Cafe). We stuck with the dim sum, which was prepared in the kitchen and brought out as it was done. The original plan was to go light here anyways, so it made it easy to just stick to a few items. We ordered the stuffed eggplants (which were good with a quite chewy texture), sesame balls (smaller than what I am used to but good red bean filling), cilantro shrimp dumpling, and chiu chow dumplings. The chiu chow dumplings were my favorite dumpling here. They were filled with peanuts, chopped vegetables and pork. They tasted like the filling of a lettuce leaf wrap, and everyone really enjoyed them. Our two vegetarian friends split the curry vegetables off the regular menu and had a separate check. The bill for seven of us was $34.67, or $6.00 each with tax and tip. We left comfortable but not full, which is exactly what we planned. The second stop was Bo Loong. This was our cart experience for the day. The service here was pretty lacking, but that might have been because we were off the main room. We asked for a knife to cut the buns, which we never got. They gave us forks and we had to ask for chopsticks. I ended up using the forks to cut the buns and to serve things like the sticky rice. We ordered Pu Li tea to start, because someone on Yelp had recommended it and I like trying new teas. It was okay, but most of us preferred the black tea they served us automatically. There was no lazy susan, which meant we needed to pass the dishes around and I had to keep reminding one of my friends to stop talking and pass the food. Food service was quick as the carts came around, but our poor vegetarian friends who ordered off the menu finally got their food almost when we were finished. And we had to remind the waiter that I had also ordered pea shoots with garlic. The dumplings were good, and we had a ton of them, ranging from Sue My (aka shu mei), Fun Goa (steamed dumpling with chopped veggie, shrimp and pork), a dumpling with scallions and some kind of meat, xiao lao (soup buns but they had sat too long and the soup had escaped from them – they still tasted good though and was the favorite dumpling for most of us) and Sin Joe Gin (fried tofu skin stuffed with sausage). We had two buns – 4 Sue Bough (baked BBQ pork buns) and 4 Guy Me Bough (a bun with coconut). I cut them up into four pieces each so we could all try them. We also ordered one sticky rice in a lotus leaf, which I normally love, but I was really disappointed with it here. Despite being packed with various meats it lacked profundity and most of all flavor. The pea shoots and garlic was delicious, and it came with a side of rice. Our bill came to $60.75, which broke down to $10.50 a person including tax and tip. 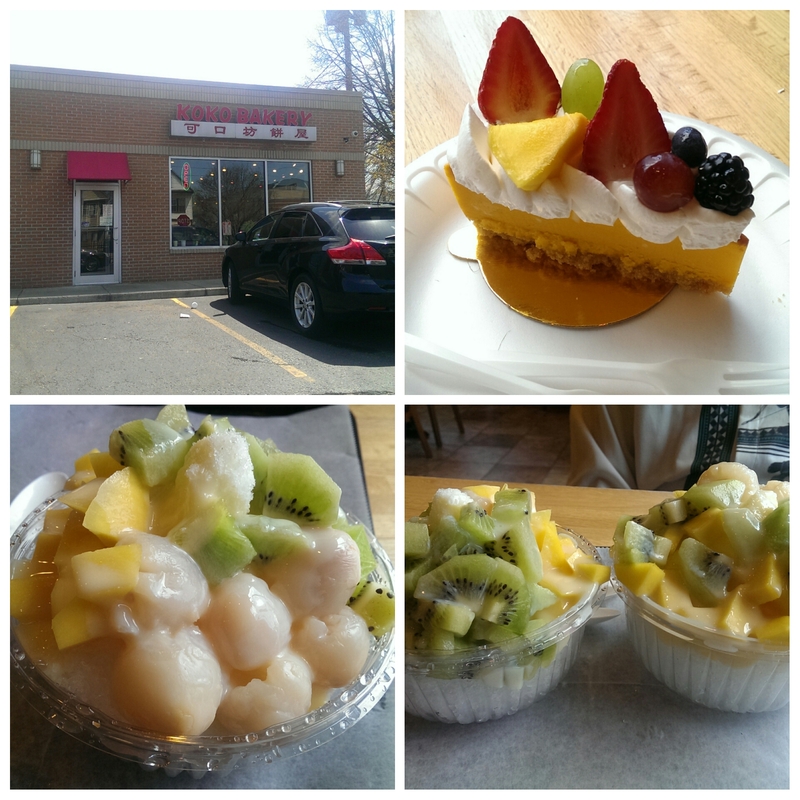 One of my friends wanted us to stop at Asia Food Company – specifically Asia Tea House, which is tucked away in the back. I was completely unaware of the Asian Town Center complex until today. I’ve driven by it several times, but have never really paid attention to it. It has several parking lots, and I was glad they had a sign pointing to the main entrance. I had read about Asia Tea House several months ago when Doug Trattner wrote about it in the Scene Magazine, but I still hadn’t checked it out. The grocery store was huge and had a wide variety of items. I plan on going back again soon to take my time and browse the aisles. The fruits and vegetables were huge (including a jackfruit that was bigger than my head) and looked very fresh. They sell live crabs and lobsters, butchered meats, fresh kim chi, frozen and dried rice noodles, and a wide selection of sodas and juices, just to name a few. We were more interested in the little restaurant tucked in the back. At this point none of us were hungry and some of my friends were done for the day, so we just popped in to check things out. They had roasted meats hanging as well as a huge variety of dumplings (and samples! 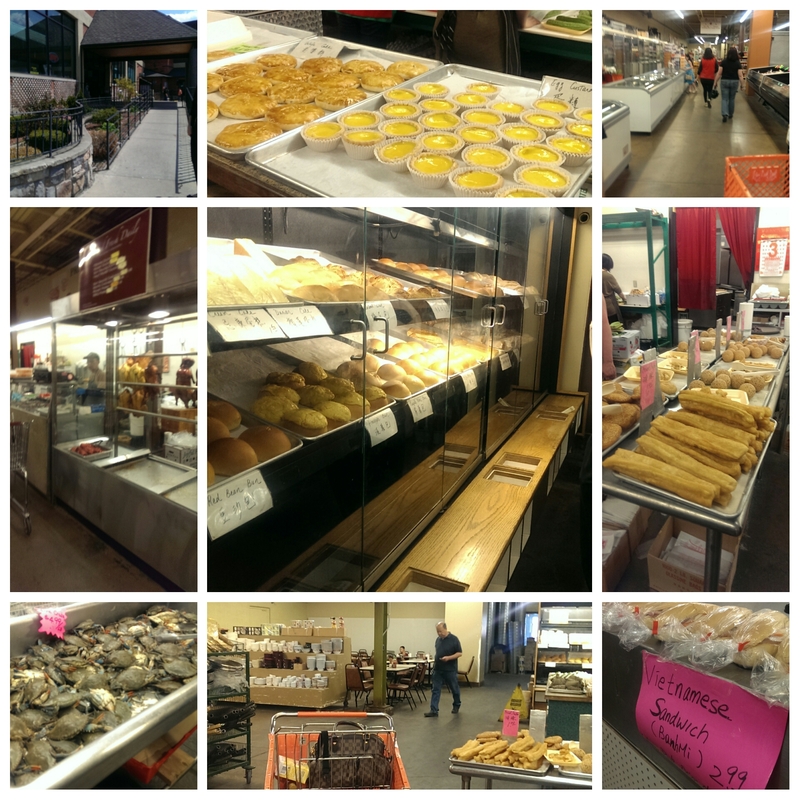 ), savory and sweet buns, and pre-wrapped bahn mi sandwiches. If you want to sit in the table area you order your soup or from around 17 entrees at the register and they will bring you tea and your food when it is ready. I grabbed a sticky rice and a bahn mi to go for tomorrow. Some other friends grabbed a couple of buns to go. We were too full to order anything and sit down. I’ll be back soon to try some of their soups. Five of my friends continued with other plans, while four of us decided to stop at Koko Bakery. My vegetarian friend had left after Emperor’s Palace last week and lamented having missed the desserts, so I wanted to make it up to her. I thought about ordering a smoothie, but decided to order a Taiwanese shaved ice ($5.35 including tax) instead. One of my friends thought it sounded good and ordered the same thing I did. They shave the ice, top it with three toppings (I ordered lychee, mango and kiwi), and pour condensed milk over it. It was very refreshing on this 78 degree day. I also felt I was getting some vitamins to balance out the dumpling overload. My vegetarian friends split the mango cheesecake, which I had a bite of and really liked. Overall, it was a successful dim sum crawl spread over two days. 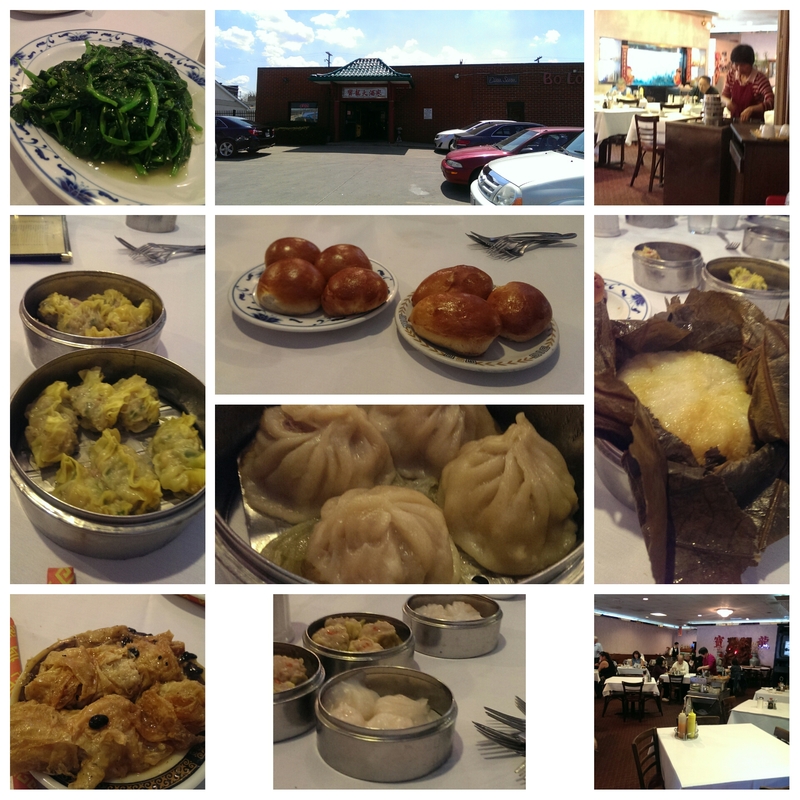 We got to try some old favorites as well as some new dim sum offerings and discovered a couple places along the way. I would not recommend doing it all the time because it is really filling, but this was a great way to spend an early afternoon on a Sunday. I highly recommend it. Bo Loong *Warning: the website is really bad. A more extensive menu is here.